We welcome Peter to the artist's we represent. I met him at the Pacific Air Museum in Santa Rosa - do go there if you have not already been. They have the most amazing airplanes. Robin Old's daughter, Christina, is the Director. Peter has been fascinated by aircraft all his life, and was an avid model builder in his early days. He was always eager to draw but put off his interest in art until recent years, concentrating instead on his career as a business writer and project manager. 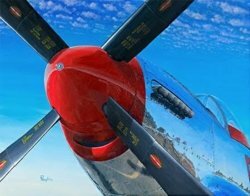 But his love for aircraft and desire to paint were not to be denied, and after some art classes at his local community college he began painting in earnest in 2012. He did a few requisite landscapes but then began painting aircraft. Though the occasional railroad locomotive, landscape, or still life comes off his easel, planes dominate. One of his paintings, a depiction of an F-4E Phantom II on a “Fast FAC” target marking mission, was painted on commission for the “Tiger FACs” of the 388th Tactical Fighter Wing, and he was honored to present it to them at their reunion in Las Vegas, Nevada, in April 2014. 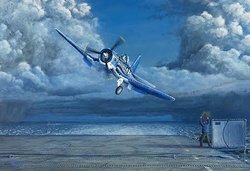 That painting is now in the U.S. Air Force Art Collection. 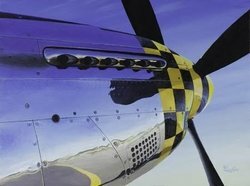 “Reflecting on the Mustang” and “SNJ Run-Up” have won local prizes. 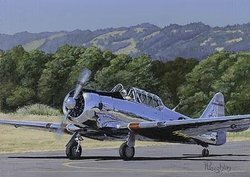 His inspiration comes from his several pilot friends, historical reading, air shows, and the many classic aircraft based at his local airport. 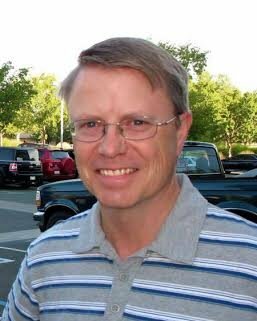 He also volunteers at the Pacific Coast Air Museum in Sonoma County, California where he and his wife live. He writes and edits the Museum’s monthly newsletter, manages other communications projects, and gets lots of ideas from the planes in the collection.